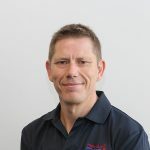 Richard joined Flex Out Physiotherapy in 2002. Prior to this, he worked in rehabilitation as the chief physiotherapist at Adamshurst Rehabilitation Centre. Richard has extensive experience in private practice, hospital and rehabilitation settings. In addition to this, Richard is a qualified Feldenkrais physiotherapist, and Kinesio-taping certified. Richard is a keen cyclist and runner.